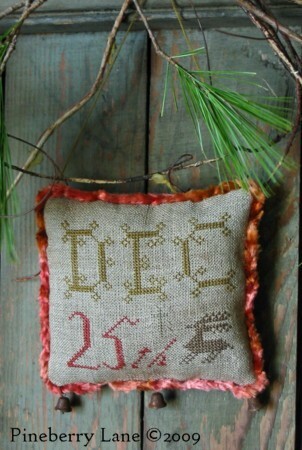 December 25th ~ a day of peace and profound gladness… This little cupboard hanger, which honors that holy day, features the prettiest letters which were originally found on an American alphabet sampler c. 1812. 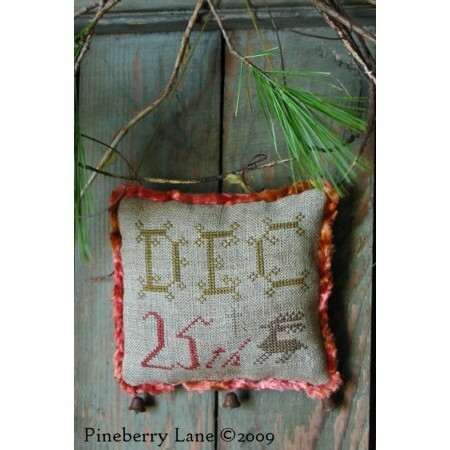 It also features a sweet little reindeer and a shining cross ~ can you see it in the center? ‘Tis faded, but it is there… I’ve added a border of my precious vintage chenille garland and adorned the bottom with 3 rusty Christmas bells. Original stitched on 32 count natural, unbleached linen. Finished size approx: 4.5”w x 4.25”h. Pattern includes color photo, professional chart with DMC floss colors, optional aging instructions, and directions for making the finished project.